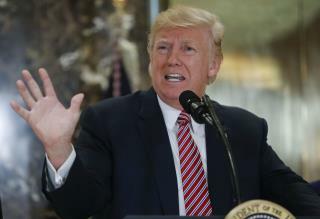 (Newser) – President Trump's first public reaction to the Barcelona van attack was to tweet a response: "The United States condemns the terror attack in Barcelona, Spain, and will do whatever is necessary to help. Be tough & strong, we love you!" His second public reaction was to spread a rumor that's been debunked, CNN reports. "Study what General Pershing of the United States did to terrorists when caught," he tweeted. "There was no more Radical Islamic Terror for 35 years!" CNN says Trump was probably talking about the rumor that Gen. John J. Pershing shot Muslims with bullets dipped in pig's blood, or buried them with pigs' bodies, during the Philippine-American War as a deterrent to insurgents. It's a rumor that multiple media outlets, Fox News included, are pointing out has no evidence supporting it. Trump talks about fake news but he tweets based on media reports. I heard from the descendants of those who served under Pershing that the pigs-and-bullets story is true. Pershing ripped off the idea from the British who dipped their bullets in pork fat when the Brits fought against the Arabs. Someone would need to interview Black Jack Pershing himself or those who served under him at the time to know the real story. But those people are all dead. Therefore, any honest historian today cannot be 100% sure if Pershing had the bullets dipped in pig's blood or not, and an honest historian would say so and deal in probabilities, not absolutes. Conclusion: The historians in the Newser story are fraudsters.